PD70X/70XG is strictly compliant with MIL-STD-810 C/D/E/F/G and IP67 standards, ensuring outstanding performance even in harsh environments. With the combined application of narrowband codec and digital errorcorrection technologies, PD70X/70XG is capable of ensuring you superior voice in noisy environments or at the edge of the coverage area. In addition, the adoption of the AGC technology also optimizes your voice. With a builtin 1W speaker, PD70X/70XG ensures clear and crisp voice communication. Compared with an analog radio, PD70X/70XG can obtain an extra 40% operation time. Benefiting from the TDMA technology, PD70X/70XG allows twice the channels based on the same spectrum resource. This is a big help to relieve the stress of increasing shortage in spectrum resource. Besides the intrinsic encryption of the digital technology, PD70X/70XG provides enhanced encryption capability (such as 256-bit encryption algorithm) and the Scrambler feature (selectable). In addition to conventional communication services, PD70X/70XG features rich data services and selectable functions such as Text Message, Scan, Emergency, Man Down (optional), vibration Auto Registration, High-speed Data Transmission and Lone Worker. 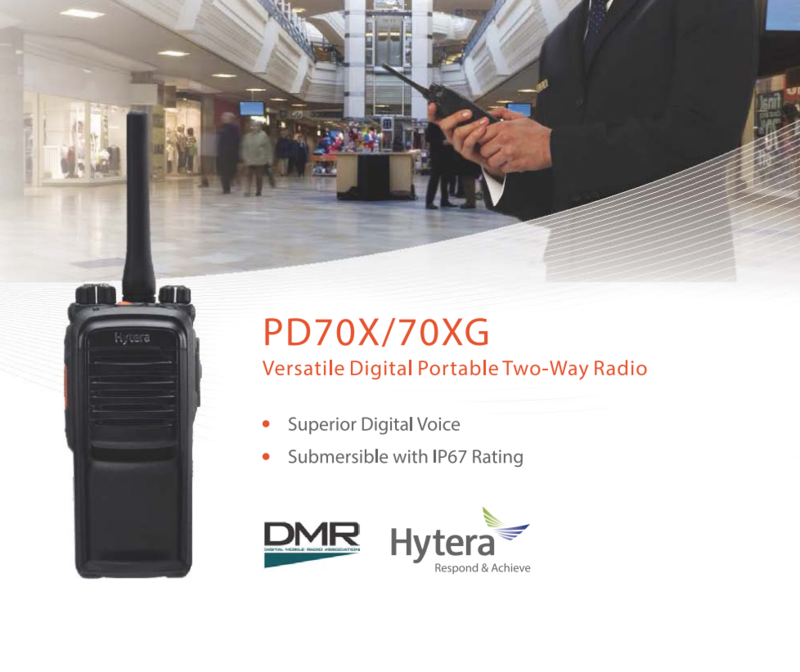 The reserved side port in PD70X/70XG allows users or any third party partner to further develop other helpful applications to extend the radio functionalities! PD70X/70XG supports option board interfaces to radio, allowing third party partner to develop various applications to interconnect with radios to control the radio to expand its functionalities! Among the supported features are voice recording, encryption etc. Please refer to the API Partner Programmed for more information!